Mary Wept Over the Feet of Jesus by Chester Brown. Published by Drawn and Quarterly. This is Chester Brown’s new book that was published earlier this year. The book contains a number of biblical stories that reinterpret the stories of women in the bible and specifically the women mentioned in Matthew’s genealogy. Chester’s last book, Paying For It was about his experience being a John and using the services of prostitutes. 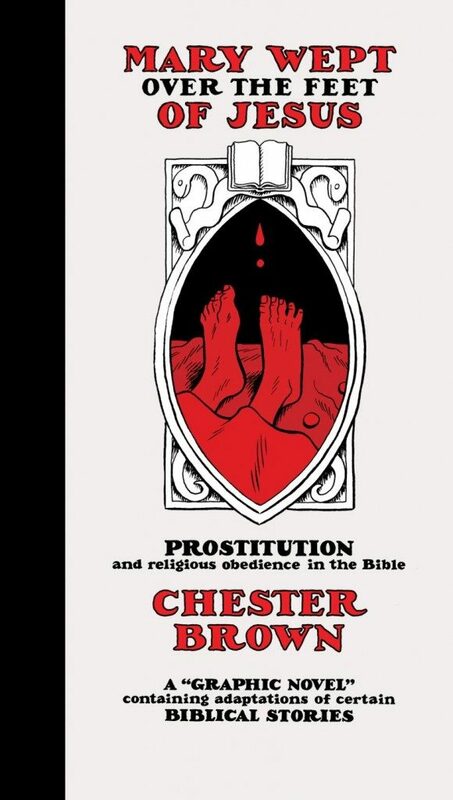 Chester believes prostitution should be legalized and uses these biblical stories to further that goal. This might seem odd because laws and moral disapproval of prostitution comes from Abrahamic religions, but Chester backs up the reinterpretations with research. Within a lengthy notes section Chester goes into detail to which biblical scholars, their books and earlier versions of biblical scripture he used to come to his conclusions. I suspect this book will be more interesting to those who are into Christianity and biblical studies. Fundamental Christians who view the Bible that absolute truth and the word of god will likely be upset, but reading the notes section (if they get that far) may awaken them to the reality that the bible as we know today is heavily edited. There are earlier scriptures that tell different versions of the stories, issues with how certain words were mistranslated among other things (google Bart D. Ehrman if you want to know more). People who have no interest in religion or prostitution may not find this book all that interesting. While I did enjoy this book and do have an interest in this stuff, I suspect people who are expecting another Louis Riel or Paying For It might be disappointed in this book. This collection of short stories doesn’t provide the satisfying feeling of Chester’s longer stories. You can learn more about the book and read an except at the Drawn and Quarterly website.